For a person who loves to create, I amazed myself this week when I realized I have never created a 2-page scrapbook layout before. Well… I guess that’s not 100% accurate- I’ve made some digital page layouts using simple scrapbook layout software and digital kits, and used old, archaic (before the digital era) mock-up page layout techniques when working as a newspaper editor, and some digital software for creating yearbook pages when I was in college and when I taught yearbook courses at the high school level. But to actually plan out and create a scrapbook layout from scratch using paper and embellishments, that is something I have never accomplished until this past week! I spend all of my time making cards and designing layouts for flyers, business cards and websites, but never for a real, honest-to-goodness scrapbook. LOL- and I must admit, it was quite involved when it came to the planning and manipulating so I have to give a big shout out to all of you who do scrapbooks all the time. Thought I would share part of the process today with everyone just to give you a peak at how I did these 2 pages that took me all week to finish. I have to start off by telling you that, as a Close To My Heart consultant, we got to order new products and “play” during the month of July. What a blast! This is one of the many perks of being with CTMH and the reason is simple- this way we get to know the new products intimately and are better prepared to help you use the papers, idea book samples, and all the many new items that were available as of August 1, 2014. It was so much fun, but like some people, I just wasn’t quite sure where to start. For me, startinhg meant choosing a new line of papers from the My Reflection collection and making a commitment to a swap project so that I had to design a variety of items. In addition to the 2 layout pages, I also had to create 2 different cards as well as some type of altered object project. My projects created using the Chalk-It Up papers, the new ShinHanart Touch Twin alcohol markers, a few embellishments and a weeks worth of trial and error. Click on this image to see the new markers in the Idea Book. I need to point out, when I got involved with this swap for one of the CTMH groups, there were some limitations. First, I could only choose one of the new paper packet sets from My Reflections. Then you had to use the stamps associated with that set of papers and some embellishments. In other words, the person designing the layouts must focus all their efforts on just one small selection from all of the new products. I thought that would be a fun way to use the new paper and stamps that I had ordered during the preview ordering month. This week long adventure was full of failed attempts and some projects that I wasn’t 100% pleased with the outcomes. So for now, this is what I have completed: the 2 page layout, 3 cards, 3 pillow shaped gift boxes, a mini album, and a Post-It Note holder, all done with the Chalk-It Up papers and following a school/teacher related theme. As an art and graphic design teacher and a professor for college courses in visual communication, one of the topics I cover with my students is how to make a living as an artist/designer. You need to know how to determine the “cost of goods sold”, how to conduct enough research to know about your target market, and, in order to price your art realistically, you must understand and respect how the art business works and how collectors or other clients/customers shop and make purchase. First step is to objectively evaluate the significance and quality of your art in relation to other similar art or design work. Next, honestly assess your accomplishments and determine how they position you in relation to others doing similar work. These tasks can be tricky and difficult but very important to succeeding in your chosen field. This can also apply to anyone selling handcrafted items. You have to ask yourself, “are you ready to do your homework, ask questions, and stand up to the unsuccessful attempts or time frames that don’t equal your expectations. Part of the homework or research that must be done, is making sure you understand the common mistakes that artists and designers make when setting prices. Perhaps the most significant error is the tendency to focus too much attention on only that segment of the market area that pertains to you and too little attention on the rest, or even worse, dismissing the rest as irrelevant. If you let this happen, your asking prices may make sense to you and to your inner circle, but make little sense to the overall target market or audience you hope to attract. The more aware you are of the big picture, of what others are creating, how it’s being priced and marketed, and who’s buying what for how much and why, the better prepared you are to price your art sensibly. So how do you price sensibly and realistically? At the most fundamental level, you must be able to make a fact-based case for what your art is worth. You certainly know how to explain what it means from a personal standpoint, but if a collector asks, can you explain it equally well from a financial standpoint? Convincing people that your art is worth what it’s priced and is therefore OK to own is an essential part of completing sales. This is especially true when buyers are on the fence, not familiar with your work, or just starting out as collectors. In the world of selling, all reputable and established artists and designers are prepared to explain their asking prices to anyone who asks. This is how the business end works. If you’re just starting out and have not sold very much, pricing your work based on time, labor, and cost of materials is often the best way to go. Set yourself a sensible hourly wage, add the cost of materials, and make that your asking price. If materials cost $50 and you take 20 hours to make the art at $15 per hour, then you price it at $350. Here are some of the ideas and advice I usually give my own students related to selling their work or services to clients. All items whether they are services or finished product, will vary in price depending on your target market, what format you are using to market your goods, if it is being sold online or in a brick and mortar store, etc. Supply and demand is crucial- if you want to make money selling your work, make something that people want or need, and that no one else is making or has done. Always keep in mind your cost of goods sold especially if you are going to run this as a business and claim the expenses and income on your taxes. For example, the set of 6 thank you notes shown to the left use paper from a paper pack, a single “just married” acrylix® stamp and another stamp from a Stamp of the Month Kit, a fancy die cut edger from a set of 4 metal dies, an archival stamp pad, alcohol markers and a blending marker, as well as 6 cards and 6 envelops from a set of 12. I cannot use the actual cost for the supplies because I am not using those just for these 6 cards so I calculate my supplies based on a percentage of what I used from my supply stash. For this example, let’s say my supplies/materials cost is $3.00 x 3 = $9.00. Next, you add the shipping and processing which includes a 6″ x 9″ padded envelope for $1.00 and postage for $2.00 for a total sales price of $12.00. Calculate your costs for materials, and then what you would charge per hour for labor, add those together for the sales price and then advertise what the shipping cost would be. For example- same card set, cost= $3.00, labor takes you 2 hours x an hourly wage of say… $10/hr which will equal a total sales price of $23.00, then advertise a shipping price of $3.00. Many times this option equals a higher selling price, so then you can give a discount and advertise a special sale while still getting a good price for your work. People are often convinced to buy something when it is “ON SALE” or discounted because they think they are getting a bargain. Advertise a coupon code for a specific time period, or a discount for a package deal or bundle, etc. Don’t sell yourself short- your work is worth it and don’t let anyone tell you otherwise. You wouldn’t ask a beautician who does your hair for a better price or a discount, and you wouldn’t ask an interior designer for a lower price or discount… you are earning a living wage and need to let people know you are in business and what you earn helps put food on the table and pays the bills. Hope this helps! I know this is probably more than you wanted to hear, but it has helped many of my students go on to earn a pretty decent wage or salary for what they make. No matter how you set your prices, be competitive. Remember… you’re in competition with other artists/designers. Every time a client or customer buys a piece of art or a design you have created, that’s one less piece that they’re going to buy from someone else. Naturally, you want to maximize the number of pieces that are purchased from you so always check for comparable goods and pricing- in other words, check out prices for similar work posted online in places like ETSY, Goodsmiths, or on business related Facebook pages . Seems hard to believe that I have been absent from my blog for almost a month. After being so busy with my son’s wedding and then a much needed vacation, I am back in the studio making memories again! Some of you have been asking for ideas to use for making your own Father’s Day cards. So I whipped up a few this past week and had so much fun I thought I would share the cards with my followers and friends. Hope you enjoy and that you are inspired to make a card for your dad- remember his big day is Sunday, June 15th. Do you want to know how you can celebrate National Scrapbooking Month? Why not spend it with me as I take you on a fun-filled adventure jam-packed full of projects, training, and new ideas? Spring is definitely here- everything is budding and blooming and as we welcome those beautiful May flowers, it’s time once again to get that artsy groove back on. Want some inspiration? Just follow me on my blog for daily tips, techniques, kits, special discounts and videos from Close to My Heart. Here is the first of many stops on our journey… inspirational clips to help you rediscover your creativity this month. Follow us every day during the month for more great ideas. Click on the “SHOP WITH ME NOW” animated button in the right side column to visit my website for more details. Ready for another great day? Some may call it hump day but I like to think of it as reaching the peak of the mountain and the rest of the week is the downward climb to our base camp. To me, every day is an adventure and I love the climb and side trips along the way where I can stop and appreciate all that I am surrounded by! Some weeks I even love the decent as much as the climb because if I am too tired or in pain from my arthritis, I can simply roll down the hill. And if I am totally entrapped in the complexity or excitement of a major project, I don’t have to worry about running out of steam but can coast to the end of my trip without exhaustion setting in. Whimsical Wednesday’s with The Jewels of Kingwood usually is filled with actual hands-on production of what we envisioned and planned on the first part of our trek. So today… as I look forward to the end of this week, I will be creating samples and practice our booth set up for the event we will be doing on Saturday here in our community. 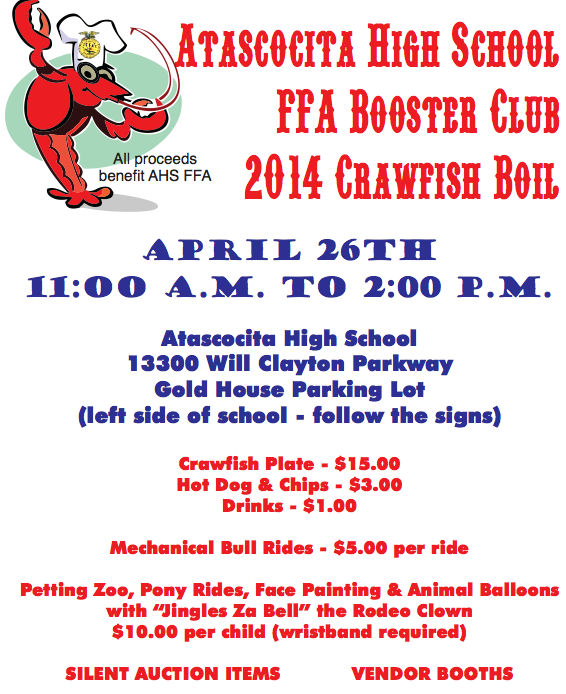 Consider this your personal invitation to join us at Atascocita High School, 13300 Will Clayton, Humble, TX, on Saturday, April 26, 2014, 11am until 2pm. We will have our booth set up and demonstrating scrapbook and greeting card layouts, scheduling workshops and gatherings, and all while helping to support the FFA club at AHS. For those of you who stop by our booth, if you mention you saw our blog or Facebook postings about this event, you will receive a special gift from me. Just look for our 3 Funky Divas banner sign and blue pop-up tent. Do you send out cards to celebrate the new year or to send a New Year’s greeting to someone special? Have you ever considered making your own card? In search of resources, I am constantly amazed at how many great ideas I come across just because I follow a lot of crafters who have Facebook pages. One inspirational place to see examples or learn new techniques is Card Maker. They even have a newsletter and if you sign up to get it, you can get a FREE pattern. 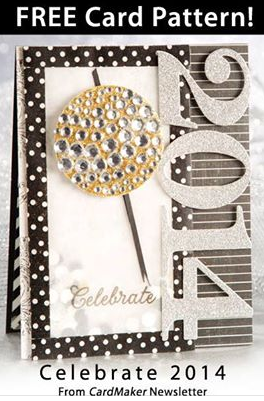 Kick off the new year by making it a creative weekend with the latest CardMaker newsletter, which contains the FREE pattern for this Celebrate 2014 card! Hope you are having a safe and creative beginning to 2014! Passion for Rubber Stampin’ ? Ever wonder where some people get their rubber stamps for all the cards and scrapbook pages they create? During the month of December we wandered around various social media pages and found some great companies. 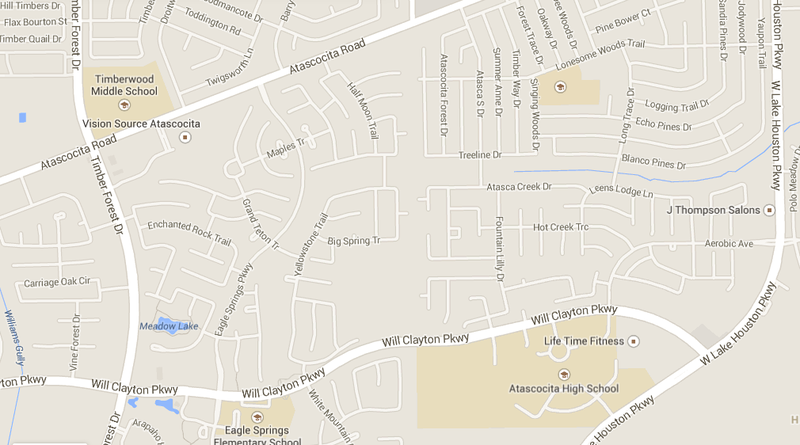 After visiting their websites, we decided we just had to share our finds with our followers. One of the best Rubber Stamp companies, offering unique and “priced right” stamps and kits, is Unity Stamp Company. If you do any stampin’ or have thought about trying out this fun creative avenue, then you just gotta check them out. They have great designs, plenty of examples done by other creative artists, kits, and super sales. If you follow them on Facebook, you will get all the notifications when they have a sale or a giveaway. We actually one a prize from a recent giveaway and I will be sharing what we created later this month as promised. Hmmm… Saturday afternoon, December 21st… 3:11pm and here I sit trying to finish up gifts and cards for Christmas. The Wise Owl Storyteller managed to get the last of the Holiday Cards completed and sent off to everyone who ordered but now, we find ourselves in a pickle. NO more Christmas and Holiday papers to complete our own cards for family. Have you found yourself in a similar situation? Well… time to improvise. Yep! Get out those embossing folders and rubber stamps, inks and colored pencils, ribbons, glitter, sequins and buttons, and get creative! Who says you have to have special papers in reds and greens to get this done? Need some inspiration? Here are a few examples for those times when you have to get extra creative. Enjoy and hope we helped you complete those last minute card making sessions. Plain green or red copy paper works great with a few punched circles and a strip of embossed card stock. Leave the inside blank and write your own message. Use heavy cardstock or scrapbook paper- any color will do. 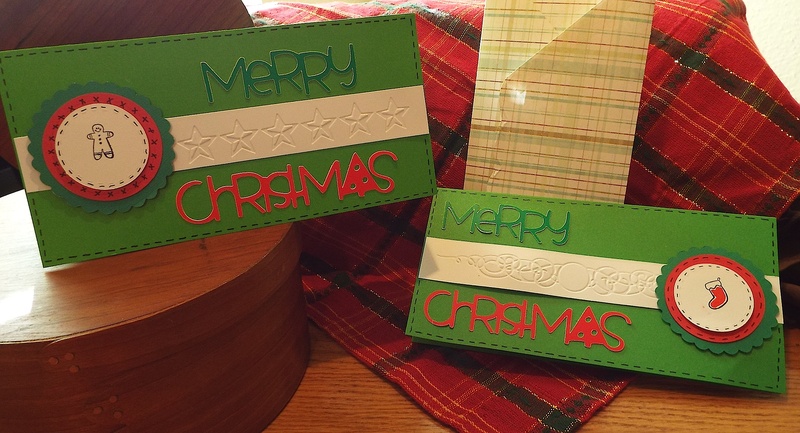 Use a paper edge punch and create a decorative edge on one side. Cut a piece of white or a neutral color for the message area. Hand ink a branch and some ties, and your lettering. Add some colorful buttons for the ornaments and VOILA! Leave blank inside for your message. This card takes very little time but you will need die cuts or your own machine to cut your own. Use a simple background design embossed paper- use your embossing machine to make your background. Emboss or cut a scalloped edge, fold over the top of the embossed background and adhere it to the front of your 4″ x 8″ white card stock. Add hand lettering or a die cut set of words. Be creative and use what you have on hand for this quickie. This one is so easy and quick. Just cut a piece of white cardstock and fold in half to give you a 5″ X 7″ card. Use a winter or snow related emboss folder and create a simple background image. Add color if wanted by using fine line markers. 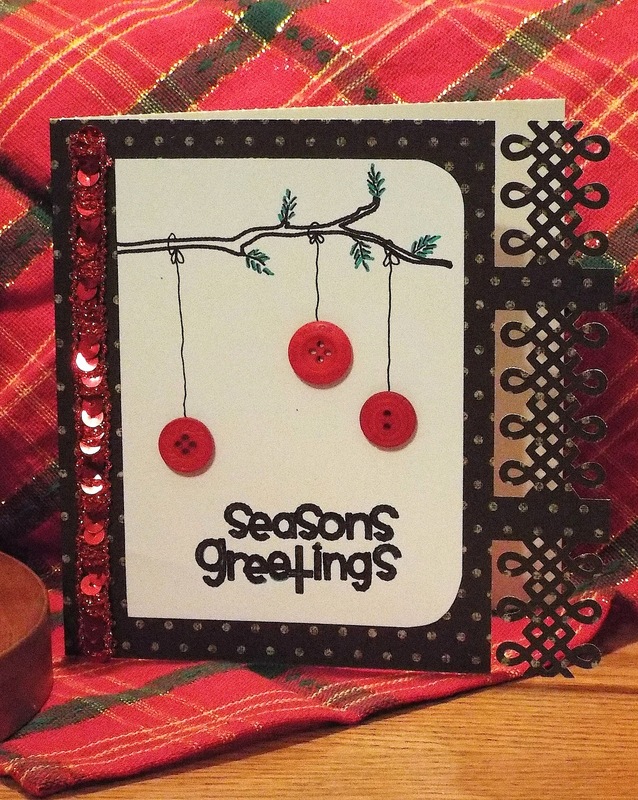 Attach the embossed background to your card front using glue dots and you’re done. Stress free activity that even the kids can complete. Don’t have a color printer? No problems! Find some music clip art or scan and print a piece of holiday music. Make a 4″ x 8″ white card and cut your music images to fit. 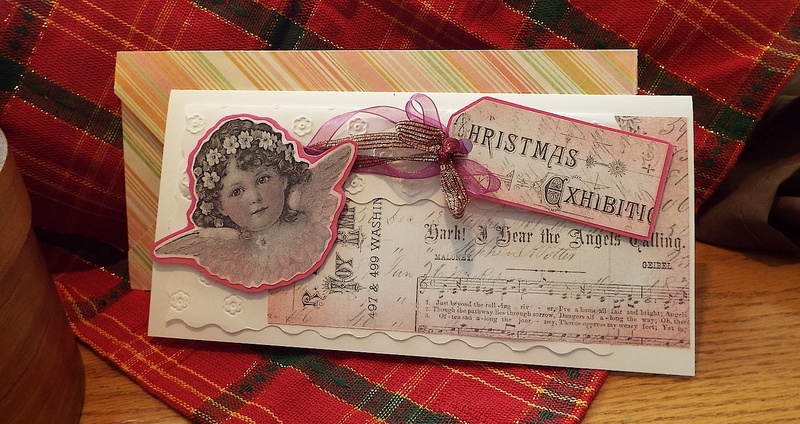 Find an angel image that looks old and vintage; there are plenty of FREE downloads on Pinterest for these types of images. Print in black and white. Cut out angel image, adhere to a colored piece of paper or cardstock. Use a pale colored ink pad and a small piece of felt to apply a light amount of inked color around the edges. Adhere all parts and complete with a bit of ribbon and a bow using whatever glue adhesive you use for card making or scrapbooking. Write your message inside. 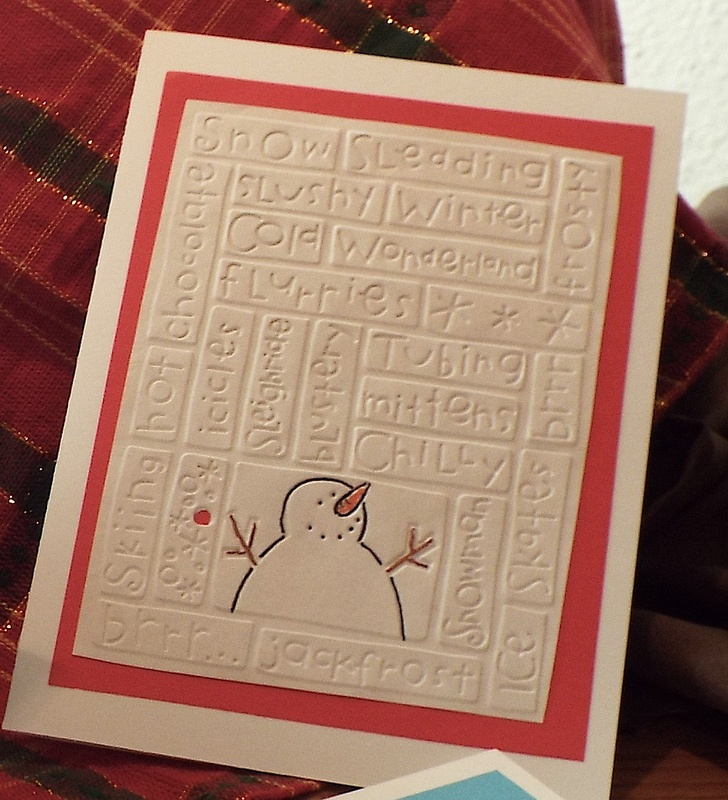 Cute as button is this adorable Snowman card. We used old buttons and a piece of ribbon for the scarf. 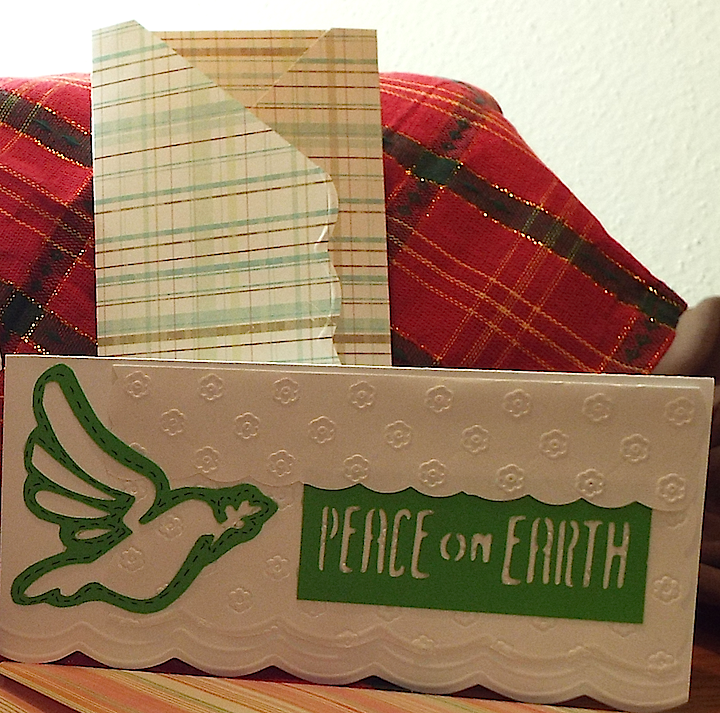 Use a piece of cardstock for the card and fold in half. Use a white paint marker to hand letter the simple holiday greeting on the front. We used a black and white snowflake background image that you can find as a FREE printable on the Internet for the background. 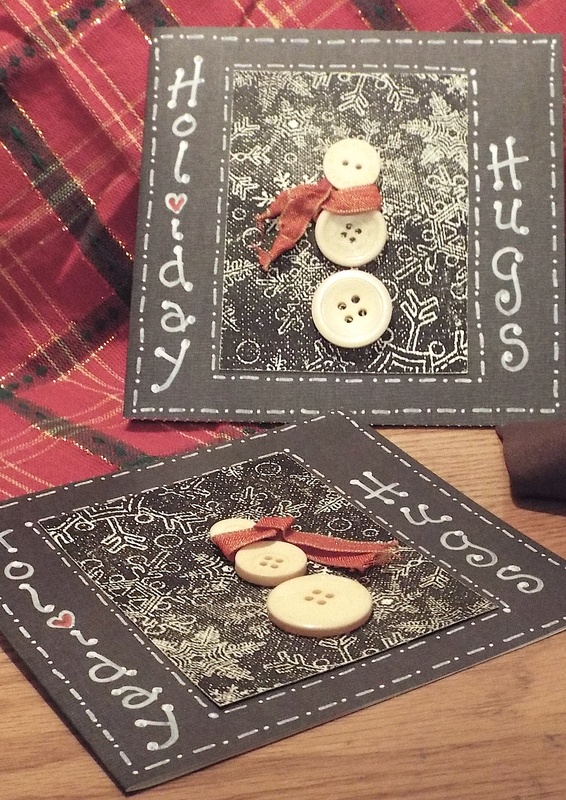 Attach all card elements using glue dots and then add your message inside. If all you have is white cardstock, try using a snowflake punch or a die-cutting machine to cut some snowflakes on the left and right flaps. 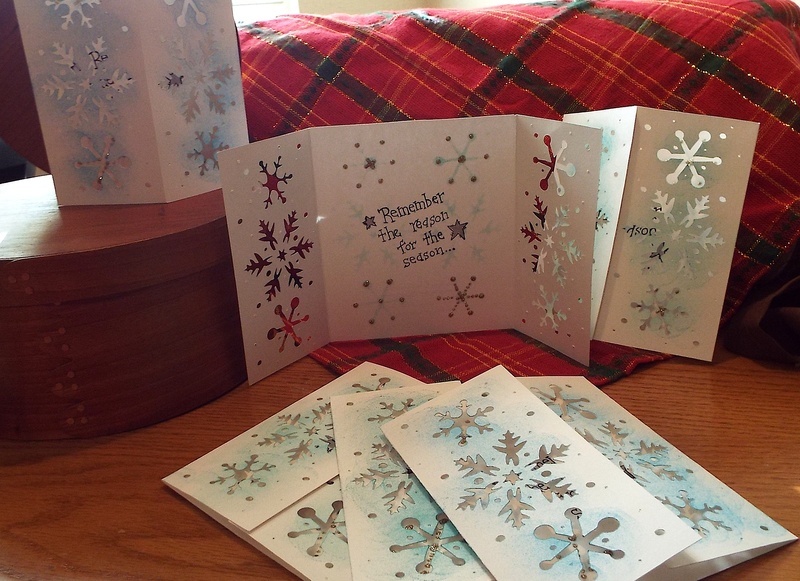 Using light blue stamping ink, we gently added some color over the cut-outs so that some of the blue stenciled through to the inside of the card. Inside we added a bit of glitter glue in silver to the snowflakes, and finished it up with a rubber stamped message. Soooo easy! Finally, we wanted to wish everyone a Merry Christmas from Texas! We used a simple 5″ x 7″ white cardstock card, made a die-cut using red for our Christmas Tree and in the middle used another cut for the shape of our state. Glued this tree in place, added a yellow die-cut star on top and finished the design using fine line markers for all the stitch lines and strand of lights. 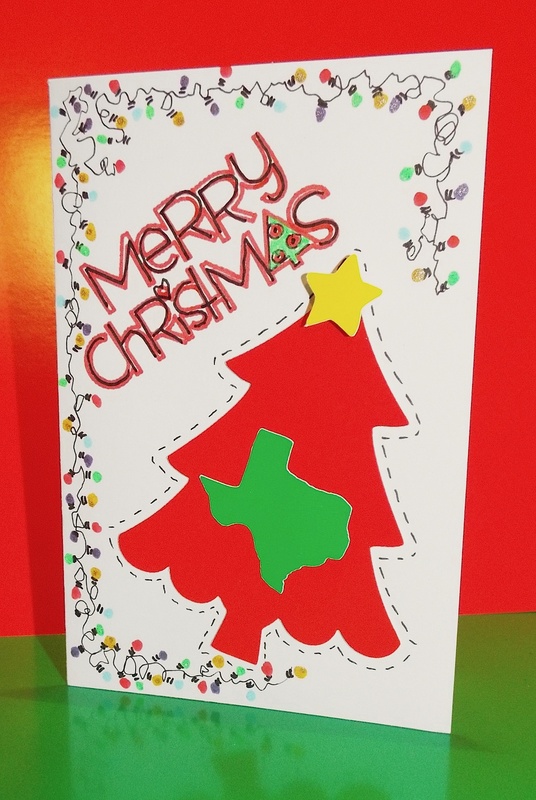 The Merry Christmas lettering was also done using die cuts but if you don’t have a machine to do this, just make a pattern and cut the tree from construction paper or cardstock. Hand letter the words using colorful markers. We left the inside blank so we could add our own personal message. Featuring indoor, outdoor & heat transfer vinyl, equipment & tools.